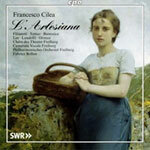 During the Italian verismo Francesco Cilea was the master of subtle portraits of the human soul, and every text from his opera L’Arlesiana attests to this talent. Leopoldo Marenco’s libretto was based on Alphonse Daudet’s drama L’Arlesienne. The maiden from Arles with whom the youth Federico falls in love never appears. However, she is the prime mover of the romantic drama centering on the youth Federico, and her unattainable presence forces all the persons of the drama to orient themselves by her. Cilea’s portrait of the despondent hero brought a young tenor by the name of Enrico Caruso his breakthrough in 1897. For its concert performance of L’Arlesiana, the Freiburg Philharmonic Orchestra obtained the services of a singer on his way to international renown: Giuseppe Filianoti, who not only has scored a brilliant success in this role in Carnegie Hall but also is at home on the stages of the New York Met and the Milan Scala.